Volume 2 contains an introduction by Joanne Harris, whose novels are published in over 40 countries and have won many awards. Michael Morpurgo has contributed a story. Michael is the author of over one hundred books, and the winner of many literary prizes. He was awarded an OBE in 2006 for services to literature. 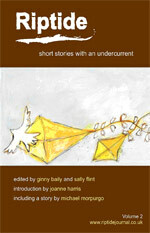 This second collection also includes stories from established and emerging writers, Nel Boswood, Séan Burke, Andrew Caink, Jane Feaver, David Gaffney, Tania Hershman, Joanne Harris (Introduction,) Luke Kennard, Eleanor Knight, Lauri Kubuitsile, Michael Morpurgo, Sarah Oswald, Jean Rafferty, Emma Seaman, Robin Sidwell, and Martin Sorrell. Front cover image by Ruth Oakley.